“Rango” opens on our title character (Johnny Depp), a pet lizard with visions of grandeur whose existence is thrown out of whack when he is unceremoniously dropped into the Mohave Desert. Wondering through the desolate landscape, he stumbles upon Beans (Isla Fisher), a fellow reptile who takes him to an Old West-style town inhabited by turtles, rabbits, moles, and the like. Like any good college freshman, Rango realizes that this is a chance for a new identity and a fresh start; he can be anyone he wants to be in a town where no one knows him. He quickly develops for himself a rough and tumble background story and paints himself to be quite the gunslinger. His reputation in town only grows when he kills a menacing hawk through a series of fortunate events similar to those that helped Buzz Lightyear demonstrate his ability to fly. He is quickly made sheriff and even quicker, his mettle is put to the test when he stumbles into a conspiracy that threatens to rid the land of its water and force the townspeople to leave. The animated debut of director Gore Verbinski (“Pirates of the Caribbean”), “Rango” is visually STUNNING. The depth to the detail of each character is magnificent and use of color is exquisite. Verbinski had his cast act out the scenes from the movie and used their movements to map out the characters. The result is an incredibly lifelike, realistic feel. You almost forget, in some ways, that you’re watching a collection of desert creatures because of how human the characters seem. The animation is to the quality of Pixar which is unquestionably the best compliment one could possibly give. I also quite enjoyed the Western elements of “Rango.” You won’t find many Westerns in my personal DVD collection but I greatly appreciate the western influence. It is richly represented here which makes the film’s shortcomings all the more frustrating. To be short, “Rango” is inappropriate for children. Far too much of the content is aimed at the adults in the audience and so many of these lines of dialogue and actions are too thinly veiled as to go over the head of most seven year olds. The argument could be (and has been) made that “Rango”s target audience is, in fact, the adults it so keenly panders to throughout. If this was indeed Verbinski’s goal (which would be perfectly acceptable), then in my opinion he should have gone full bore and taken aim at the PG-13 rating. Some parents will have no problem with the content and that’s fine; I cast no judgment in their direction. But those who will (and I think these parents will be greater in number) are being put into a bad position. If they don’t read a review going in, they’re likely to believe “Rango” is family friendly, kid’s fare and why shouldn’t they given its rating and marketing campaign aimed at children? And while I know so many of the family movies from my youth were packed with content I didn’t understand until later in life, animated features should be held to a different standard in my book. . While none of the content was anywhere near as rough or potentially objectionable as, say, the average episode of “Family Guy,” the difference is the little box at the top of the screen that says, “TV14.” Parents can choose whether or not to put any stock into that warning but at least the warning has been laid out. 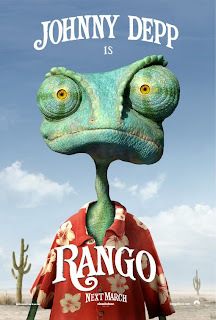 “Rango” also suffers from an overall lack of humor. The dialogue is well written and fairly quick witted but to be honest, I very rarely laughed. The jokes seemed heavy handed at times while at other times they simply weren’t funny. So while much of the content is overly adult-themed, the humor didn't really work for this adult. This leaves “Rango” with an identity crisis that it struggles with throughout. There are some truly fun moments and as I said the visuals are unmatched in quality. But the lack of flow or identity left me feeling as if my time had been wasted, something I very rarely experience in a theater. Care for another take? Check out Cinema Slant's slightly more glowing review.